Writs R Wrought: What is a Sampler? In embroidery, a sampler is a wall hanging that shows off many different styles of stitching and usually contains an alphabet, some small pictures, and a saying. Young girls would stitch the sampler while still at home so they would have the patterns of the stitches after they married and had their own establishment. In confections, a sampler is a single container with several different sorts of candy that showcase the manufacturer's abilities and hopefully lead to sales of other containers dedicated to your favorite flavors. 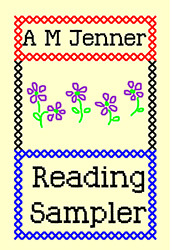 My newest book, Reading Sampler, is made in the same tradition. There are excerpts from six novels in three categories: Assignment to Earth (Science Fiction); Tanella's Flight and Fabric of the World (Fantasy); Deadly Gamble, A Heart Full of Diamonds, and Inherit my Heart (Suspense). The intent is to allow readers to try my books and see if they'd like to read more. Reading Sampler is available on paper for $12.99 – a full 320 pages of enjoyment, complete with a free autographed bookplate. I expect more people will grab the free ebook. Yes, you read that right. I'm so confident I can "hook" you on my writing that I'm willing to give away a free ebook as "bait". Go ahead. I dare you. Download it. Share it with your friends. I'm betting that when you get to the end of the sampler, you'll do whatever it takes to find out what happens next.